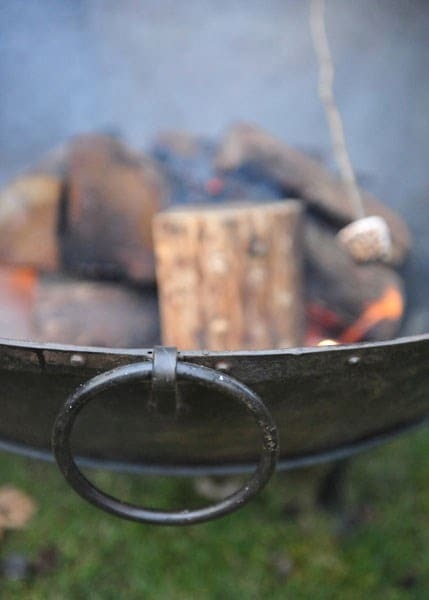 Buy Large Indian fire pit bowl: <ul><strong><li>Robust recycled iron</li><li>Protective coating</li><li>Suitable for both logs and charcoal </li></strong></ul><br>Our take on a traditional Indian cooking bowl is ideal for creating a warm, cosy ambience outdoors. Perfect for al fresco entertaining or simply sitting by to relax and enjoy the peace of the garden at night.<br><br><b>Caring for your fire pit</b><br><br>These Crocus Collection fire bowls are made from recycled iron coated with a durable fire-retardant paint. They may be left outside all year round, but certain safeguards will help prolong their life.<br><br>When not in use, we recommend standing bowls on their side to prevent them filling with rainwater; leaning against a wall in a sheltered spot is ideal.<br><br>To keep the metal in good condition, regularly coat the surfaces with cooking oil or reapply heat-retardant paint. Over time, exposed metal will naturally rust to produce an oxidised protective coating, but the bowl will retain its structural integrity over many years of use.<br><br>Measurements:<br>Ø80cm x H40cm<br>Weight 21kg, thickness approx 3.5mm<br><br><strong>Warning:</strong><br>For outdoor use only. Keep children and pets away from the brazier when lit. Always position away from buildings or combustible objects on a safe, level, non-flammable surface. If using on a paved patio, place on an additional protective paving stone made from solid natural stone or concrete at least 5cm thick. This will avoid possible discolouration and cracking of your patio, as some mock slabs made from resin or ceramic may be susceptible to heat damage. Only for use with logs or charcoal. Never leave a lit fire pit unattended or move when lit. Allow to cool before emptying any ash. Our take on a traditional Indian cooking bowl is ideal for creating a warm, cosy ambience outdoors. Perfect for al fresco entertaining or simply sitting by to relax and enjoy the peace of the garden at night. These Crocus Collection fire bowls are made from recycled iron coated with a durable fire-retardant paint. They may be left outside all year round, but certain safeguards will help prolong their life. When not in use, we recommend standing bowls on their side to prevent them filling with rainwater; leaning against a wall in a sheltered spot is ideal. To keep the metal in good condition, regularly coat the surfaces with cooking oil or reapply heat-retardant paint. Over time, exposed metal will naturally rust to produce an oxidised protective coating, but the bowl will retain its structural integrity over many years of use. For outdoor use only. Keep children and pets away from the brazier when lit. Always position away from buildings or combustible objects on a safe, level, non-flammable surface. If using on a paved patio, place on an additional protective paving stone made from solid natural stone or concrete at least 5cm thick. This will avoid possible discolouration and cracking of your patio, as some mock slabs made from resin or ceramic may be susceptible to heat damage. Only for use with logs or charcoal. Never leave a lit fire pit unattended or move when lit. Allow to cool before emptying any ash. Bought this after searching for a good quality fire pit at a reasonable price. Nice and large to accommodate us all sitting round it. Can't comment on how well it works as not used yet but it looks good unlike some flimsy ones on the market. Bought in winter sale at a good price. Waited some years before getting a fire pit, as wanted a decent size, and one like the original Indian Fire Pits they've been modelled on. This is a good size, is solidly built and solidly built, not something that would erode quickly. Very pleased with it, and have used it a bit, and in winter. This brazier is heavy duty and should last for years. Not sure what else you can say about a garden fire pit product. Hi. I bought two of these braziers for a party and they were great. I would now like to also use them to cook. Do I buy the tall or the short stands and do you do the tripod for hanging pots for cooking too? Thanks. Hello, you can use the low or the tall tripod to cook on the Indian Brazier. Unfortunately, we do not stock the tripod for hanging pots. Hope this helps. Can you supply an iron grill to go with this? This will not be particularly stable without the stand and is not advised to place on the ground without the stand when in use. 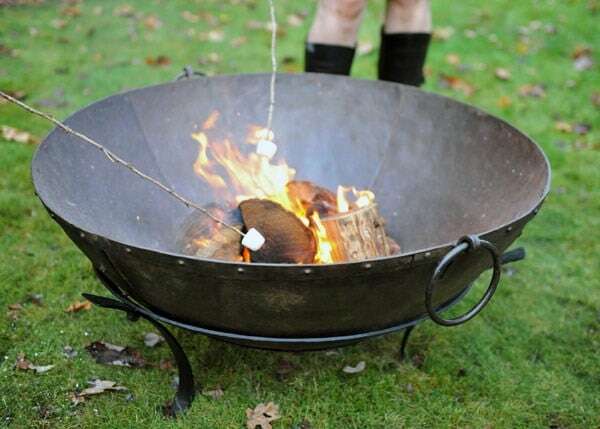 Do you have to store this Brazier inside during the Winter or can you just leave it outside in the weather? Does it need covering ? 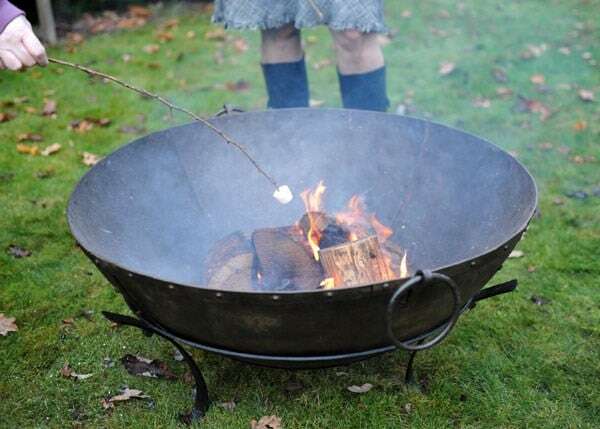 This brazier can be left outside in the weather as after some use the product will rust, which will give the metal a natural protective layer. It can be covered to protect the product further but as this brazier is made of iron with a waxed lacquer it is built to last. Hello there No it is an outdoor burner for keeping you warm really. Where are you located? - we'd like to view some of these fire pits before making a decision. Hello, We are located in Windlesham in Surrey, but we are only open to the public a few days a year - please click on the following link for more information. If there is a particular product you want to see on our open day, it may be a good idea to call beforehand to make sure we either have it in stock or can display it for you. Can you burn coal (not charcoal) in the brazier or just wood? Hello, You should be able to burn coal, charcoal or wood in this brazier.